It seems that the first leather pig came into being almost by accident when ‘Old Bill’, who worked making hand luggage for Liberty’s of London, wondered what could be done with the leftover leather. 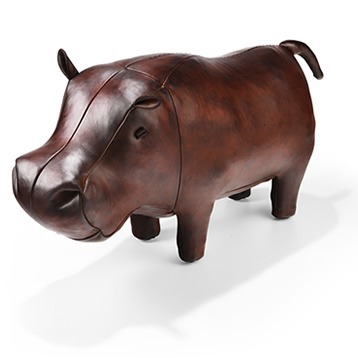 He came up with the idea of a stuffed leather pig footstool! The first pig was sold through Liberty’s in 1927 and Liberty’s has stocked the animal ever since. 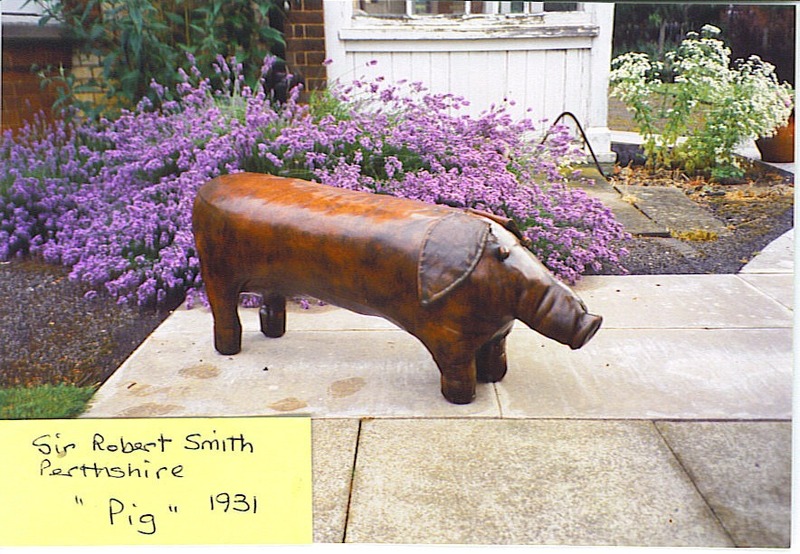 In those days the pigs were made from pigskin and had very long noses! To celebrate our 90th birthday in 2017, we designed a “90th anniversary pig” along the style of the original. Production is limited to 90 pieces and the issue number is stitched on to the pigs underbelly. Select product code ENG/1702 for this animal. Dimitri Omersa and his wife Inge came to England in 1955 and settled at Lavender Croft, a sanctuary for refugees in Hitchin, Hertfordshire. Dimitri Omersa, a Yugoslav by birth, had been a naval officer and a political prisoner having been imprisoned by Tito for 10 years after the second world war. Dimitri Omersa found work in the leather trade and whilst representing a small leather company in Hitchin met ‘Old Bill’ at Liberty’s. ‘Old Bill’ was due to retire and a deal was struck for Dimitri Omersa to take over the business and continue the supply of pigs to Liberty’s. The business was re located to Hitchin in 1958 and before long Dimitri Omersa had ideas for other animals! 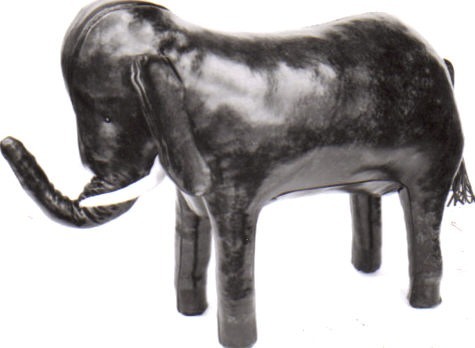 His first new piece was the leather elephant, followed by the leather donkey and leather rhinoceros. Initially, Liberty’s were sceptical of the rhino but it became a “best seller” and subsequently formed the Omersa logo. The animals were sold exclusively through Liberty’s up until the mid-1970’s. Animals made during this period have the words “LIBERTY OF LONDON” embossed on the underside of an ear. Dimitri Omersa wanted to expand the business and so took the animals to North America. In 1963 he entered the new donkey in the Californian State Fair and won a Gold medal. The animals caught the eye of Abercrombie and Fitch, at that time purveyor to the fantasies of the rich and famous, who sold the animals from the mid 1960’s through to the late 1980’s. Since then the animals have developed a significant following in the USA which we continue to enjoy. 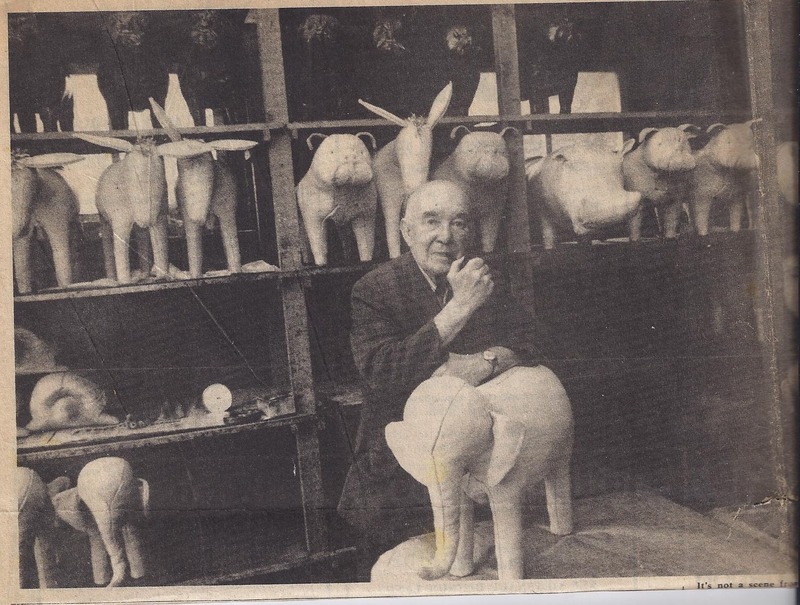 Dimitri Omersa passed away in 1975 and his wife Inge carried on producing the animals for a further 10 years. In 1985 another “Hitchin” family acquired the business from Inge Omersa. The business continued to grow by adding to the product range and introducing new sizes to meet the economic needs of the market place. In 1999 the business was relocated to Coningsby, home to RAF Coningsby, in rural Lincolnshire. The business has continued to expand and today Omersa offers a range of 37 animals each available in a variety of sizes. We remain true to the original methods of manufacture and continually strive to produce a product that is quirky, fun, and above all well made!